Explore the complex cultural history of American folk music with a free lecture and concert on March 9 from the Southern Foklife Collection at Wilson Library. 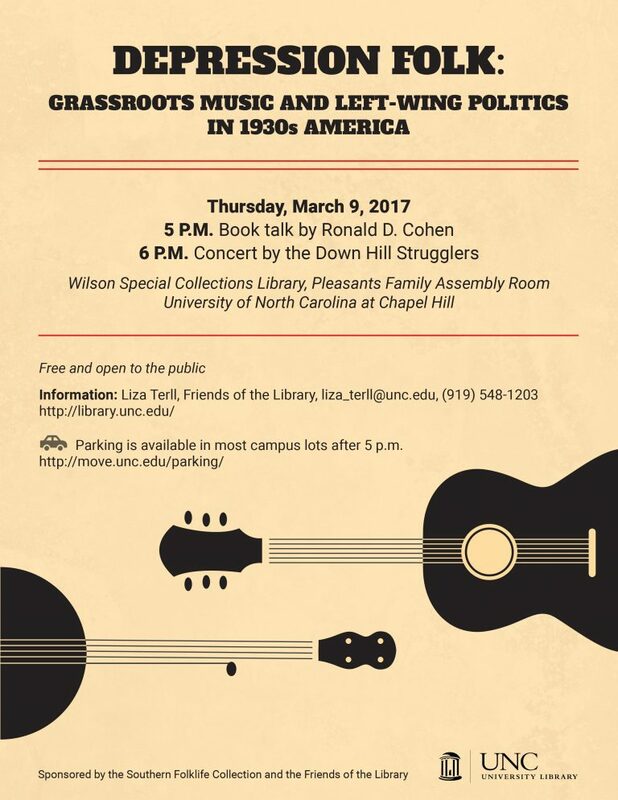 Ronald D. Cohen, author and professor emeritus of history at Indiana University Northwest, will deliver the talk “Depression Folk: Grassroots Music and Left-Wing Politics in 1930s America.” Cohen will discuss how the interplay of musicians, government agencies, and record companies had a lasting impact on the decade and beyond. Following the lecture, old-time string band The Down Hill Strugglers will perform. The trio—Walker Shepard, Jackson Lynch, and Eli Smith—uses folk instruments to bring old rural America to listeners. The talk will begin at 5 p.m in the Pleasants Family Assembly Room. The concert will follow immediately at 6 p.m.